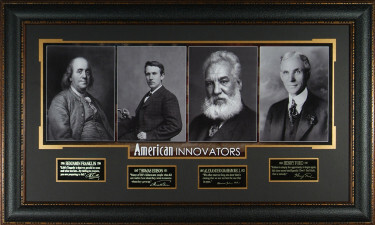 AMERICAN INNOVATORS unsigned 4 Photo Engraved Signature Series Custom Leather Framed with Benjamin Franklin, Thomas Edison, Alexander Graham Bell, and Henry Ford. Featuring the Laser Engraved Signatures (Replica Autographs) of Benjamin Franklin, Thomas Edison, Alexander Graham Bell, and Henry Ford. Quality Framed as shown with quotes from each. FRAMED SIZE: 23x38".